After an entire season of snow predictions that never panned out, it finally snowed in Asheville, North Carolina. Now, friends and family in the mid-west will laugh and say that it wasn't real now. 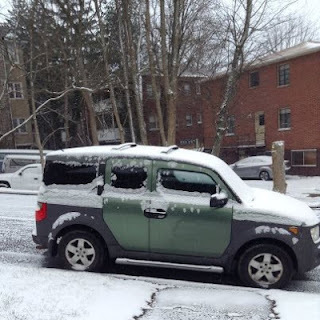 I'm not even sure it was an entire inch of the white stuff, but there was snow. In the south that means only one thing. Everyone ran to the stores last night and bought bread, milk, and eggs. I've never quite figured out why but because of it we started our own tradition: snow day French Toast. I am pretty happy that we made the decision to experience the city life for the winter months. If there was an inch of now down here that meant the mountain could have a lot more. Not that it would be impossible but the way we chose to build our house might make it a little more unpleasant. Never mind that we are off the grid and we collect our water from the spring. Never mind that we don't have a traditional heater with a thermostat. The big issue is that we built the house 200 vertical feet up our mountain. Regardless of the weather we have to walk up and down our mountain to the tiny house. We chose that location because we loved it but we also recognized the limitations. But one of the things I love about the tiny lifestyle is that it gives us the ability to do more than one thing. I'm really enjoying our stay in town for a few months while we wait for spring to, well, spring. I snickered as I read this today. Just this morning I had to break out the snow blower to remove a solid foot of the white stuff that fell last night. Great way to spend my first hour awake. 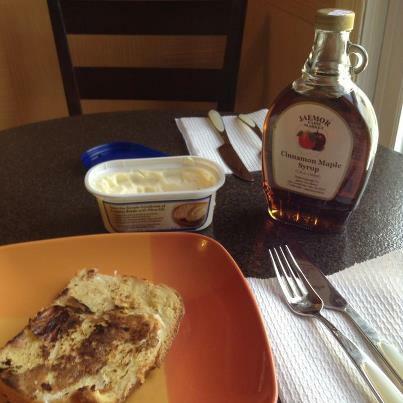 Snow day french toast does sounds like a wonderful idea. I hope ya'll are well and staying warm. Apparently this is the last cold snap before the days return to the 60s. I. can't. wait.